A lot of individuals skip over this holiday, now. Most think if you are not Irish who cares. I think it is more of out of respect to do so since, Irish immigrants came here for a new beginning. Beside I am Scottish but my maiden name is spelled the Irish way and I married an Irish man. Love you hon! Fold it in half and then fold it in half again and one more time! Cut a heart shape with scissors but DON’T cut all the way to the bottom! You will just get 4 hearts. After they dry you could add a stem. 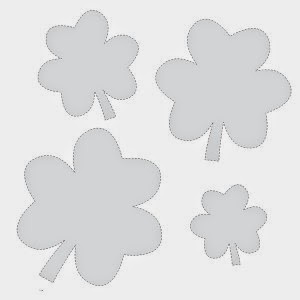 Print out the shamrocks and then cut them. 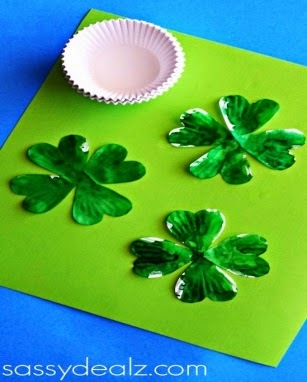 Cut out some clover leaves in varying colors and patterns from cardstock/construction paper. Punch a hole in the center of each clover leaf. Depending on the width of your straws you might need to use a smaller than normal hole punch or poke your own holes so the straws don’t slip through. 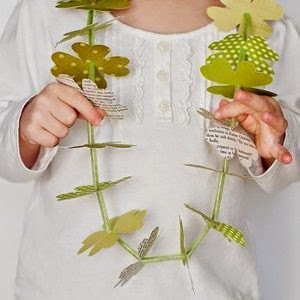 Next cut a length of string or yarn and alternate stringing the paper clovers + straw pieces. When it’s long enough, tie the ends of your string together and that’s it! So easy and definitely a crowd pleaser with the kids! Enjoy making your own Clover Leaf Leis! Adult Supervision need for hot glue! 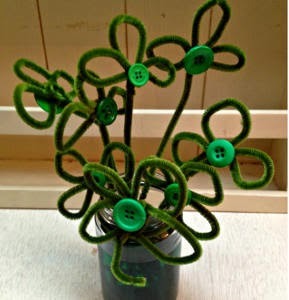 Make your shamrocks as in the picture and then hot glue the buttons on. Option: add water with a little green food coloring.